We are politicians from very different Parties and backgrounds, but we are strongly agreed on one thing: It is high time that the winds of change blew through British politics. 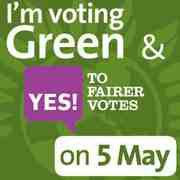 If, like us, you think that our political system is broken, then we hope you will vote YES to fairer votes on May 5. Make no mistake about it: it is organisations such as the BNP and the Communist Party who are praying and campaigning for a NO vote, and desperately hoping that electoral reform is stopped in its tracks. If you think it is fine to let extremists win on a minority of the vote, then feel free to vote NO on May 5. But if you think that your MP should have a majority of the voters in their constituency behind them, then you should vote YES. Under our current system, most people have an MP that they didn't vote for. More than 2/3 of MPs were elected with fewer than 50% of the vote. Too many MPs think that they have a job for life. Half of all seats have been in the same party's control since 1970. This can breed arrogance and complacency. When MPs take their constituents for granted, abuses of the system are more likely. THIS is our chance for electoral and political reform. Stuart Agnew MEP (UKIP), Ian Gibson (former MP for Norwich North), Norman Lamb MP (LibDem, North Norfolk), C'llr. Adrian Ramsay (Deputy Leader, the Green Party of England and Wales), C'llr. Rupert Read (Co-ordinator, East of England Green Party), Simon Wright MP (LibDem, Norwich South). A BBC reporter on 2pm news on Saturday Ap.30 [just now] on Radio 4 spoke of William and Kate as 'Man and wife'. It's official then: women are appendages. Feminism never happened. She promised to 'obey' him... Oh wait: she didn't. This was BBC spin. Pure and simple. This was an utterly inappropriate turn of phrase. I can barely believe that it occured. Women and all decent-minded people living in the 21st century will know that the Beeb are even more conservative than the new Duchess of Cambridge - unless this gets apologised for. UKIP Leader Nigel Farage joined with Green Party Leader Caroline Lucas MP, Alan Johnson MP and Tim Farron yesterday morning at a press conference, calling for a Yes vote on May 5th. Mr Farage and Ms. Lucas warned that the First Past the Post system was "alienating a whole generation of voters" and called on people to make the positive case for reform in the final week of the campaign. Andrew Grice (Inside Westminster, 23 April) recycles the conventional wisdom that the introduction of #AV will benefit the Lib Dems. But no one knows what effect AV will have on the Lib Dems. This is because AV, by eliminating tactical voting attributed to the "wasted vote" argument, changes first-preference voting behaviour too. So it is entirely possible that, where Lib Dems currently win seats, they may do worse under AV, because voters who currently lend them their "tactical votes" will no longer do so. 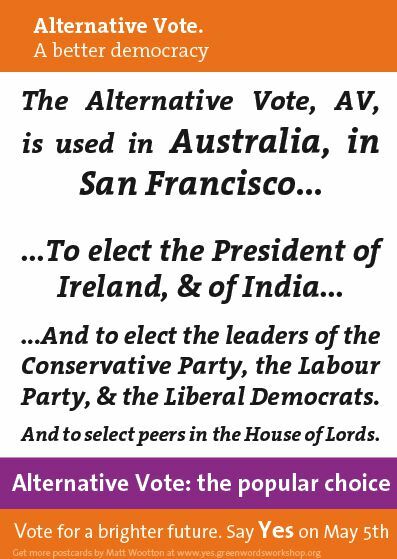 One thing we know for sure about AV, from the Australian experience, is that AV is terrible news for extremist and racist parties, which probably explains why the BNP are vigorously arguing for a No vote on 5 May. This is because racists virtually never win a majority at the ballot box  and a majority, not merely a plurality, of the votes is what one needs to win, under AV. So it is quite likely that the Lib Dems, quite widely disparaged now, would, under AV, suffer, just as the BNP would. It is quite possible that many angry voters would leave them off their preference lists altogether. 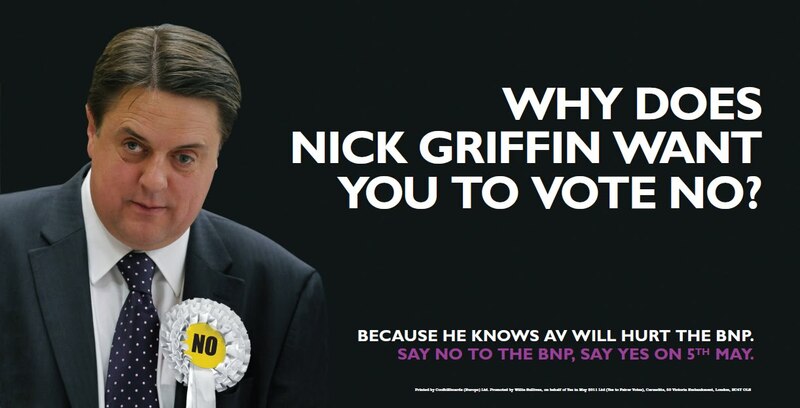 If one wants not only to wipe the smile off Nick Griffin's face, but also to punish Nick Clegg and his "betrayal" in a really clever way, the best way of doing so is to vote Yes, on 5 May. Unless you’re an election junkie like me, you’re probably either bamboozled or bored (or both) by the debate over AV. Most people get the basics that under AV you can rank the candidates. But then how are these preferences counted? Does AV give some voters extra votes? Is the weight that AV gives to lower preferences fair? Thankfully, most of us know more about voting systems than we realise: we’re used to them from The Eurovision Song Contest, The X Factor, even figure skating and a host of other non-political contests. To see the basic case for AV, look at the difference between Britain’s Got Talent and The X Factor. BGT uses first-past-the-post, the current Westminster system. There are ten contestants in the final; whoever gets most votes wins. The trouble is that if votes are widely spread across the contestants, victory could be secured on little more than a tenth of the vote. Diversity beat Susan Boyle in 2009 even though the dance group won less than a quarter of the vote. Someone with a small but committed following could win, even if the rest of the country despises them. The X Factor avoids this: after each round, the singer coming last is kicked out. Eventually only two remain and the winner has majority support. AV achieves basically the same without requiring us all to traipse back to the polls each week. With your first preference you say whom you want to win. Your second preference says whom you want to win if your top pick gets the boot and so on. You can’t change your mind under AV, as you can in The X Factor, but otherwise the logic is the same. The anti-AV people claim that AV gives some voters extra votes. The X Factor shows why that’s wrong. Matt Cardle’s supporters got to vote for him each week. They had just as many votes as the people who switched from loser to loser to loser. In AV too, if your first preference stays in the race, your vote for him or her is counted once in each round, just as it is if your vote is transferred from your first to your second to your third preference. What about the claim that AV gives too much weight to lower preferences? To get a handle on this, cast your mind forward to the glitterfest of Eurovision, coming a week after the referendum. In Eurovision, each country ranks its top ten acts. The first gets 12 points, the second 10 and so on. The winner is the act with most points. That means that preferences are weighted: lower preferences give fewer points than higher ones. But these always count, which means that you could scupper your favourite act’s chances by giving ten points to your second favourite. In AV, by contrast, lower preferences have the same weight as higher preferences — but only if they are counted. Your second preference is counted only if your first choice has been excluded. It’s like first counting only the 12s. Only if no candidate has a majority of the 12s do you eliminate the act with fewest 12s and count instead the second preferences of their supporters. Look at Britain’s great triumph of 1981, when Europe made its mind up for Bucks Fizz. Defenders of great British traditions should be aware that we would have lost under first-past- the-post: Bucks Fizz gained only two 12s, tying for fourth place behind Switzerland, France and Germany. They won because they secured lots of eights and tens and because Eurovision counts these lower preferences. But they would have lost under AV too: with so few first preferences, we would have been eliminated before our deep well of middling support could have been tapped. So AV does give special weight to first preferences: you need a decent number of them to stay in the game in the early rounds of counting. Easy as 1, 2, 3 - new genius video for #Yes2AV ! disaster in Japan one month ago. amount of radioactive materials have been emitted into the atmosphere and the sea. and those people do not even know when they can return to their own homes. Please forward this message to anybody who may be interested. Why the BNP are voting NO. "We are never going to get our feet under the table under the AV system." Please watch the video, and then forward the email to all your friends / share the link on Twitter or Facebook. We've got just 2 weeks left now, to change our electoral system for the better - or to be shafted by the Tories, the BNP and the right-wing press, who will be the ones gloating if Britain votes NO on May 5. Funds for this will help us once again move forward on May 5 - can you assist? Remarkably, I beat one of the panel's chosen 'top 5' on 1st preferences. 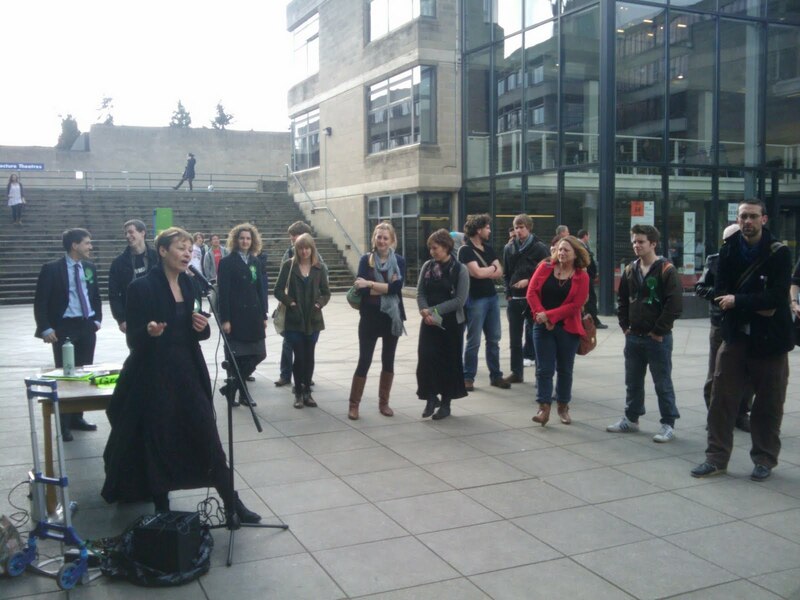 An unprecedented achievement in Green Party Lords candidate-selection contests. December 2010 [Note: Obviously the timetable has slipped]. by the political parties in the last general election." In other words, the Coalition agreement COMMITTED the ConDems to giving (presumably) those Parties who won seats at the 2010 election a proportional number of seats in the Lords, up to the time when House of Lords reform occurs. THIS WOULD MEAN THAT THE GREEN PARTY SHOULD GET 7 SEATS. Supporters of electoral reform laud bishops' intervention but NO campaign warns against turning referendum into 'moral crusade'. ...Yes: It's immoral to perpetuate a blatantly undemocratic system like FPTP. Clarity begins at home: An open letter to Labour NO. Clarity begins at home. If you are so clear in your own minds that AV is a bad system, you need to draw the logical conclusion: you need to get rid of it for your own internal elections. That I hear no-one proposing to do so speaks volumes to me: in your hearts, you know that AV is a better system than FPTP for a modern plural democracy. So join us: There's still time! 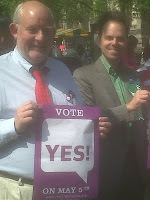 Declare for a YES vote on May 5. Just debated John Flack, at a Sixth Form in Wymondham, who like me narrowly missed being elected to the Euro-Parl in 2009 (in his case, for the Tories). He is Regional Head of No2AV here in the East. Before the debate: 20 in favour of Yes, 40 against, 26 undecided. :-( After the debate, 44 in favour, 42 against. :-) A hopeful straw in the wind? If we get our arguments right, YES people, we can WIN. Utterly incredible - but the letter is authentic. 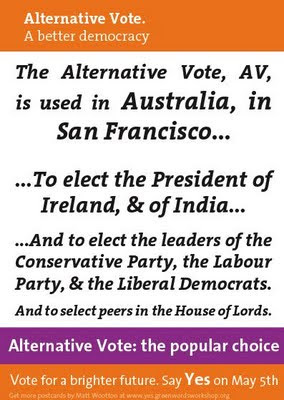 The BNP want you to vote NO to AV on May 5 - Find out why a YES vote will help stop extremists. Caroline Lucas speaking for a AV and for a Green vote in local elections at UEA, Norwich. direction I think we’re likely to be going in. We’ve got the Scottish Parliament elections coming up, as I say, on two polls now Greens have been ahead of the Lib Dems, and it’s very much our strategy to replace the Lib Dems as the third party in British politics." SIR – I am disappointed that so few British people are backing Britain’s stance on Libya. The Iraq attack has clearly cast a long and terrible shadow over the world in general and our foreign policy in particular. What a pity that so many people seem to be unable to take seriously the thought that maybe the UN intervention in Libya is on balance a good thing, because before their eyes is always the image of the quagmire, the illegality and the lies of Iraq. Libya is utterly different from Iraq. It is a legal exemplification of the “responsibility to protect”, begun in response to an authentic uprising; whereas Iraq was an illegal war of aggression. The deepest problem with 'Make it 50', I think, is this: We can't. Or at least, it doesn't feel as if we can; or we are very unlikely to. A slogan needs to involve the listener, to make them think that there is a way that they can really be part of what is being called for. So, for instance, a slogan like "AV: The system to stop extremists" gives one the feeling that one can be part of the stopping of extremists by voting for AV. 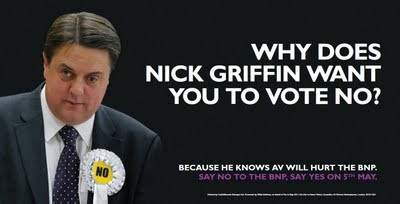 And one can, in the sense that if the AV referendum is passed then it will be easier to stop the BNP at the ballot box. But 'Make it 50' HIGHLIGHTS as central the actual numerical mechanism by means of which AV works. Not only is this cryptic and vague, it is techy/nerdy, and it focuses the listener's attention directly on the need to get to 50%. Which will for many hearers immediately lead on to the thought, "But my vote never makes the difference between whether someone gets to 50% or not" - especially in a nationwide referendum! So the slogan hardly inspires participation in the referendum, and, by focussing attention on what it takes for a candidate to win, rather than on WHY one should be voting for that candidate (or for that option in the referendum), it fails the most elementary tests imposed by Lakoff or Westen. It doesn't inspire, it doesn't have a values-component. It summons up futility, disempowerment, and perhaps even hopelessness - presumably, the diammetric opposite of what was intended by it. For a better way forward, check out our #Yes2AV postcards at http://www.yes.greenwordsworkshop.org/ . If you like, do share! Go 8 minutes in to see the live debate: http://www.itv.com/anglia/anglia-late-edition-thursday40134/ This debate between me and 3 MPs took place live on ITV last night: the subject is AV. . .
1. 2. 3. Rupert's Read: April 2011 4. 12. 15. 18. 19.